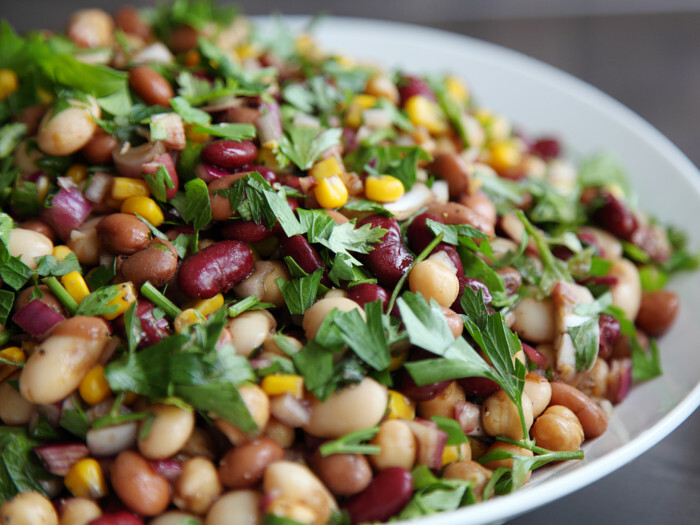 This classic 5-bean salad is a great addition to any feast. It is filled with proteins from the different kind of beans and I love the combination of soft, boiled beans and the crunchy veggies along with the fresh herbs. Use either canned beans or soak overnight and boil the dried beans a few hours before making the salad. A bowl-full of wholesome goodness! To begin with, first, drain and rinse the beans under running water in case you are using canned beans. If you are using dried beans, boil and then drain them. Combine the beans, corn kernels, onions, and parsley in a large mixing bowl. Zest the lemon directly over the salad. Whisk together lemon juice, olive oil, salt, and paprika in a small bowl and pour over the salad. Now toss the salad to combine and chill in the refrigerator for 30-40 mins before serving. Enjoy the delicious and wholesome salad, which can be consumed for 3-4 days if refrigerated. With the season slowly changing to winter, you can also add warm oven roasted vegetables. You can check the link given alongside for the recipe. (https://www.myweekendkitchen.in/lentil-salad-roasted-vegetables/).